Hot and cheesy spinach dip, grab some chips, toasts or crudites and dig in! 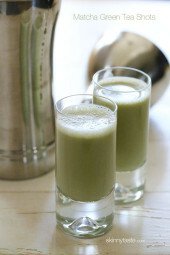 Perfect for parties or gatherings, you can double or triple the recipe as needed. I first posted this recipe back in 2010, my oldest daughter Karina loves this dip! It was the only way I could get her to east spinach and made it often for her as an after school snack. Other dips you may enjoy are Buffalo Chicken Dip, Hot Chicken Philly Cheesesteak Dip, and Crab Guacamole or check out a full list of Skinny Party Dips. With the Super Bowl coming I thought I would revive it! You can prepare this a day ahead and bake as needed. It can also be frozen before heating up if you want to prepare this a few days ahead. Check out a full list of my Super Bowl Party Food ideas. Place in an oven-proof dish and bake at 375° for 20-25 minutes, until hot and cheese is melted. This was delicious! My husband and I will never order it out again. Simple and so flavorful. Thank you! I made this dip for Christmas Eve and it was beyond good. So good that I’m still thinking about it!! !A definite keeper iin the rotation. This was some of best spinach dip I’ve ever tasted. Next time I think I may add some lump crab…, delish! Can you use the “powdered” Parmesan Cheese you get in the grocery store in the shaker? Hi there! Can you please tell me what baking dish size? Thanks! I made this for a family Easter get-together. Was so embarrassed. No one ate it. They ate the chips and veggies that I brought to go with it, though. The dip ended up getting thrown away. It did not turn out well. 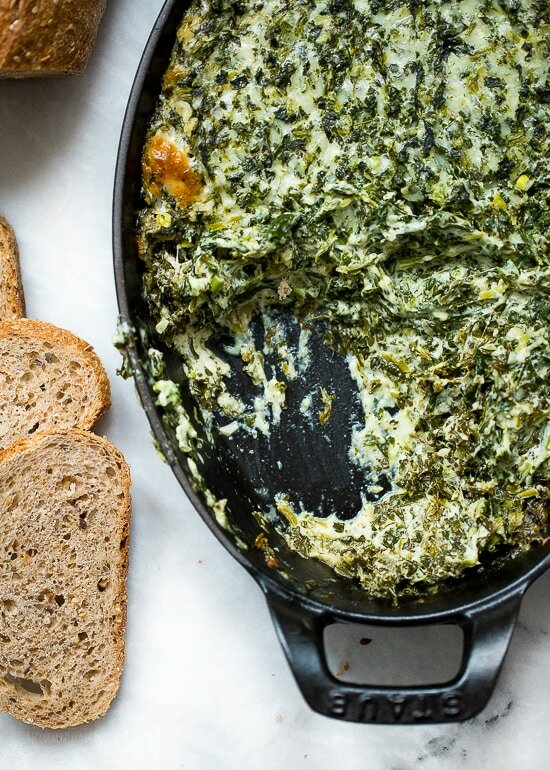 Doubled this recipe for a Christmas party and it got rave reviews from everyone as “the best spinach dip I’ve ever eaten”. We served it with sea salt & olive oil flatbread crackers, which really let the dip speak for itself. Bravo! Very easy to make and absolutely DELICIOUS!! Thank you guys for posting this recipe. Made it without the scallions but will use them next time!! No one knew that it was Skinnyfied….it tasted so good! How did it go in the mini crockpot? I’m going to try it today. Can I make this early in the day, keep it in the fridge raider and cook it later. I found this under the “Freezer friendly” section of SkinnyTaste. But it also says to serve immediately. Can it be frozen and defrosted/consumed later? Just made this and found it to be very tasty. I used fresh spinach and added about 5 garlic cloves. This looks delicious! Would it work to add crab meat (or imitation)? 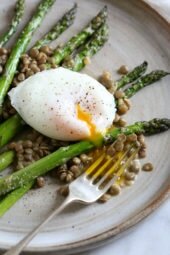 Love this recipe, but now that I’m doing low-carb, I find I don’t know what to eat this with. Haven’t liked any alternative chip recipe that I’ve tried. Any ideas? Maybe try the mini bell peppers cut in half? I’m also doing low carb and just discovered these wraps called extreme wellness. I found them at a regular grocery store by the regular wraps. I cut them up into “chips” spray them with olive oil spray and bake until crispy! 5 net carbs I believe. Great alternative! 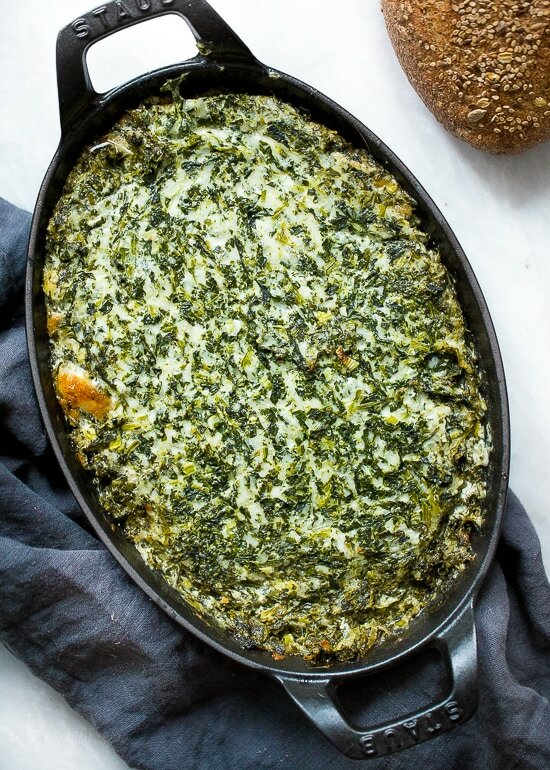 What about using fresh spinach instead of frozen? I used fresh, also a bit of baby kale, because I needed to use up the kale. Tasted great ???? This dip is amazing! 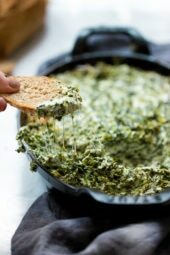 I’ve also tried your spinach and artichoke dip! I’ve never used recipes that are consistently good. I’ve lost 15 pounds and my boyfriend 40. We have kept it off for a long time now, and your recipes definitely help with that. When people ask us how we did it. We say it’s a balance of healthy eating and exercise and direct them to your website. Keep up the great work!! Thanks Caroline! Congrats that is awesome! Huge hit in my house for Super Bowl! Thank you for the recipe. the recipe says ” 1 cup (4 oz)” of shredded mozzarella -which is the proper measurement? Instead of sour cream and mayo can I just use Greek yogurt?? Can you add artichokes to this? Do you think I could add chopped artichokes to this? 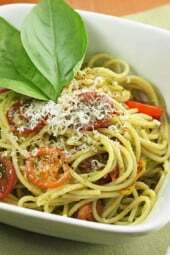 Do you use grated, shaved or shredded parmigiano? I usually use grated but you can use whatever you have on hand. I want to make this for the game. What kind of chips should I serve this with? One of my favorite “old school” skinnytaste recipes! But Gina, one clove of garlic? More like 7 in our house! We love this at our house, which is why I haven’t made it in 2 years. I made it for the Game of Thrones season premiere and hubby and I ended up eating the whole thing all 10 servings by ourselves. So good but dangerous for us. Is there something I can replace the mayo with? I have the same issue. Egg allergy. Does anyone have a mayo sub? Do you have a substitution that could be used for sour cream? Made this tonight for New Year's Eve…OMG amazing taste!! Can't believe this is "light"!! Thanks SkinnyTaste!